Marijuana has been used both medicinally and recreationally since ancient times and interest in its compounds for pain relief has increased in recent years. The identification of our own intrinsic, endocannabinoid system has laid the foundation for further research. Phytocannabinoids have been identified as key compounds involved in analgesia and anti-inflammatory effects. Other compounds found in cannabis such as flavonoids and terpenes are also being investigated as to their individual or synergistic effects. 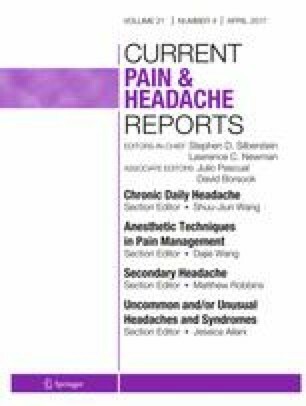 This article will review relevant literature regarding medical use of marijuana and cannabinoid pharmaceuticals with an emphasis on pain and headaches. Philip S. Kim declares serving as a consultant for Medtronic, Jazz, and Collegium, and as the Chief Medical Officer for CBsync. Michael A. Fishman declares no conflicts of interest.